Findings of the National Survey of Student Engagement (NSSE) identify certain education opportunities as high-impact practices, which require “considerable time and effort; facilitate learning outside the classroom; require robust interactions with faculty and students; encourage collaboration with diverse groups; and provide substantive feedback.” These components are often found in the most successful education abroad programs. This includes study abroad, internships abroad, service learning abroad, and research abroad. When designed with intentionality for high impact, education abroad programs can be transformative for students. 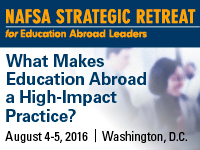 The August 2016 NAFSA Strategic Retreat for Education Abroad Leaders in Washington D.C., will discuss high-impact practices and explore how professionals might incorporate more of these components within the education abroad opportunities they develop for their students. NAFSA Strategic Retreats allow participants to think profoundly, strategically, and creatively about the outcomes of their work as educators. Each event offers time and space for you to consider the forward-thinking issues for our field. Leave this event inspired to build and safeguard the high-impact experience of education abroad through your institution’s programs while strengthening connections with fellow experienced professionals in the field like you. Read guest speaker Julie Park's July 2016 Trends & Insights column, "Strangers from Different Shores: The Role of Race in College Experiences." Enhanced creative problem solving techniques for developing original program solutions. New approaches to staff development that encourage better individual and team performance. Purposeful cross-institutional communication techniques with high-level program stakeholders that overcomes challenges and generates support. Designed for directors, deans, faculty, and professionals with extensive experience in education abroad, the NAFSA Strategic Retreat for Education Abroad Leaders cultivates a multifaceted consideration of education abroad. The format of the NAFSA Strategic Retreat for Education Abroad Leaders is intentionally open; retreat attendees set the agenda through a series of defining activities. By the end of August, all NAFSA Strategic Retreat for Education Abroad Leaders attendees receive a copy of the campus discussion guide and graphic recording. Retreat attendees will be invited to reconvene at the NAFSA 2017 Annual Conference & Expo in Los Angeles, California, for a follow-up discussion. Julie J. Park is assistant professor of education at the University of Maryland-College Park. Her research addresses how race, religion, and social class affect diversity and equity in higher education. She is particularly interested in how macro-level conditions such as institutional demography and structural inequality affect organizational culture and patterns of cross-racial interaction. She is widely published and the author of When Diversity Drops: Race, Religion, and Affirmative Action in Higher Education, an examination of how universities are affected by bans on affirmative action. For the retreat, she will reflect on how her research examines how the structure of a campus and the diversity of both students and the student college experience affect short- and long-term student outcomes. The NAFSA Strategic Retreat for Education Abroad Leaders will be held at NAFSA headquarters in downtown Washington, D.C.
Reserve your seat by July 5 for savings. Save up to $100 with advance registration. Pricing includes pre-retreat materials, two continental breakfasts, one lunch, and drinks at off-site reception. Registrants will also receive a 10 percent discount on registration for the NAFSA 2017 Annual Conference & Expo in Los Angeles, California. Participants in the NAFSA Strategic Retreat for Education Abroad Leaders can reserve hotel rooms through the NAFSA block at the Washington Plaza Hotel. Rates are $159 per night plus taxes. Come for the NASFA Strategic Retreat – stay for Washington’s world class restaurants, museums, and attractions! With your NAFSA Strategic Retreat badge, you will receive special discounts at select restaurants, museums, and other cultural centers. To receive these discounts, simply present your NAFSA Strategic Retreat badge. For more information on current offers and deals, visit www.washington.org/syb. Cancellation or request for changes to registration for the NAFSA Strategic Retreat for Education Abroad Leaders must be made in writing and received no later than two weeks before the first day of the retreat. For the August 4-5 retreat, any cancellations received after July 22 will not be refunded. Refunds, if approved, will be processed four to six weeks after the retreat. All requests for changes, cancellations, and refunds must be made in writing. Please send requests by e-mail to educationabroad@nafsa.org. The NAFSA rate expires on July 10. Registrants should call the hotel directly or visit the linked page to book accommodation.